A more convenient version of your favourite Cadbury hot chocolate. Just add water for the smooth, creamy taste of Cadbury hot chocolate. This handy single serve 28g sachet of Cadbury Instant Hot Chocolate is Fairtrade certified. Suitable for vegetarians. 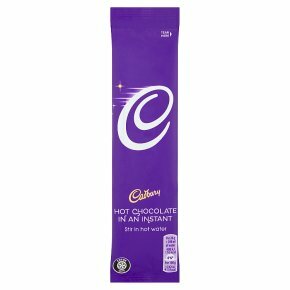 Preparation Instructions (with 200 ml hot water): For the perfect Cadbury Instant Hot Chocolate simply put one sachet of Cadbury Instant Hot Chocolate into a mug, and stir in hot water. Then enjoy a Cadbury Instant moment.